The client commisioned the LAB for an immersive arrival moment and beacon for the entrance of the Collective Design Fair. Aptly named Tinsel Town, an undulating passageway made of CNC-milled plywood ribs thatched over with reflective mylar fringe welcomes visitors into a world of Collective Design's signature blue. Inspired by the performance and choreography of the red carpet, Tinsel Town utilizes a mixture of digital and handmade craft to result in a site-specific, interactive installation that breathes almost as if alive. 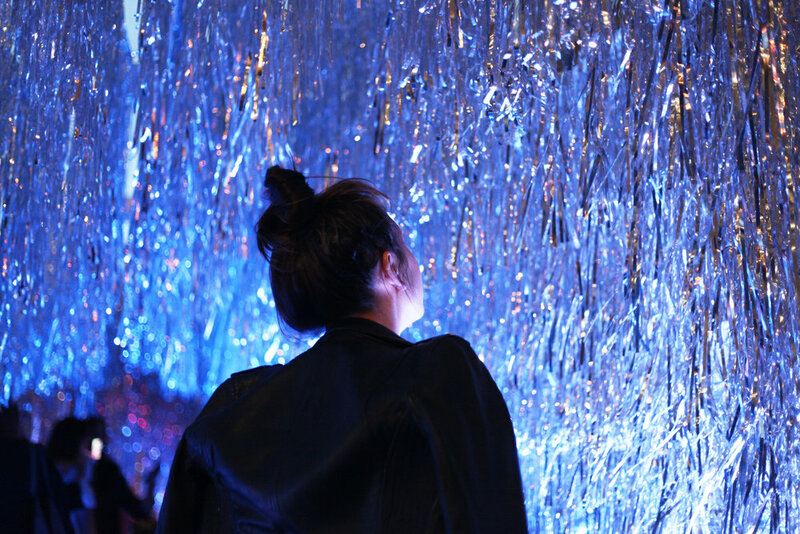 The reflective tinsel partnered with an array of IR sensor, colored LED lights creates transformative moments inside the installation. In the morning, Tinsel Town is a silver, sparkling jewel illuminated by the sun. At night, Tinsel Town becomes a glowing, multi-colored tunnel encouraging visitors to circulate through the piece. We worked with The Factory and Philips Lighting to create Tinsel Town. It was constructed and embellished in under 6 hours, using over 1,500 feet of mylar.